If you want to update Realtek PCIe FE Family Controller drivers in Windows 7, solutions in this post will help you. Find an easier solution depending on your case. Windows provides some generic device drivers like network drivers. So you can use Windows to update the drivers through Device Manager. 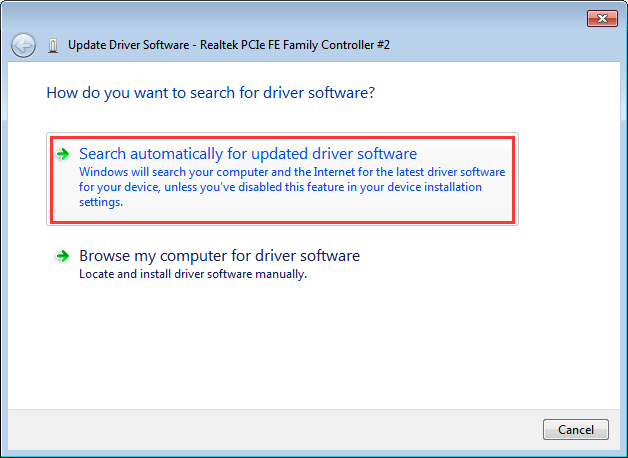 Take following steps to update your Realtek PCIe FE Family Controller drivers in Windows 7. 4. Click Search automatically for updated driver software. The Windows will automatically search and install new driver for your network card. It is possible that Windows does not install the driver successfully. In this case, you can go to Realtek’s website or your PC manufacturer’s website to download the latest drivers. It is a little hard to download Realtek PCIe FE Family Controller driver in Realtek’s website, because you need to identify the controller specific model name. It is recommended that you go to your PC’s manufacturer’s website to download the driver. Drivers can always be downloaded in Download section or Support section of the website. 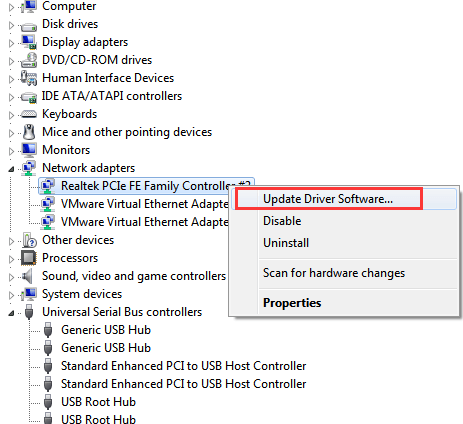 An easier way for you to update Realtek PCIe FE Family Controller drivers is using a driver update tool. 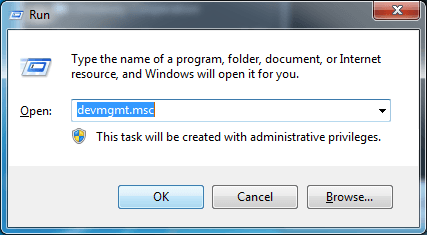 Driver Easy is a useful driver update tool compatible with Windows 7. 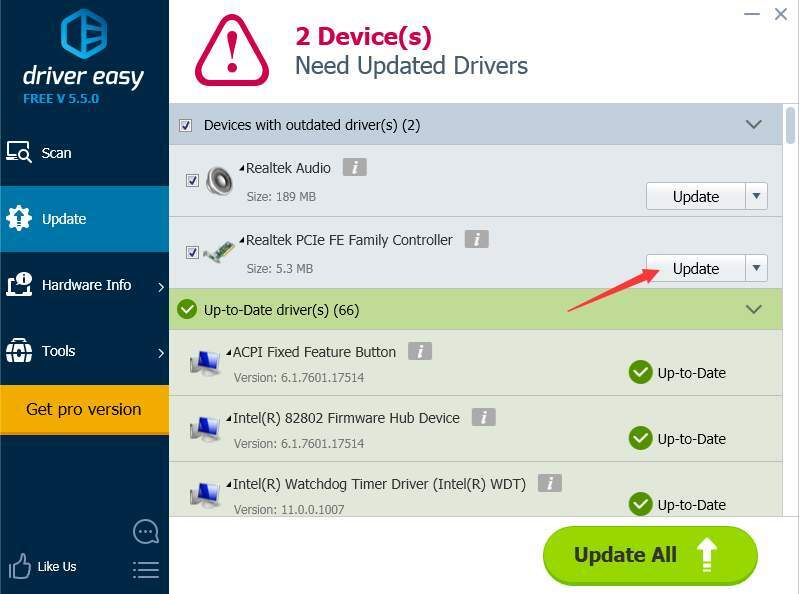 You can use it to update Realtek PCIe FE Family Controller drivers with just 2 simple steps. Step 1: Click Scan Now button. 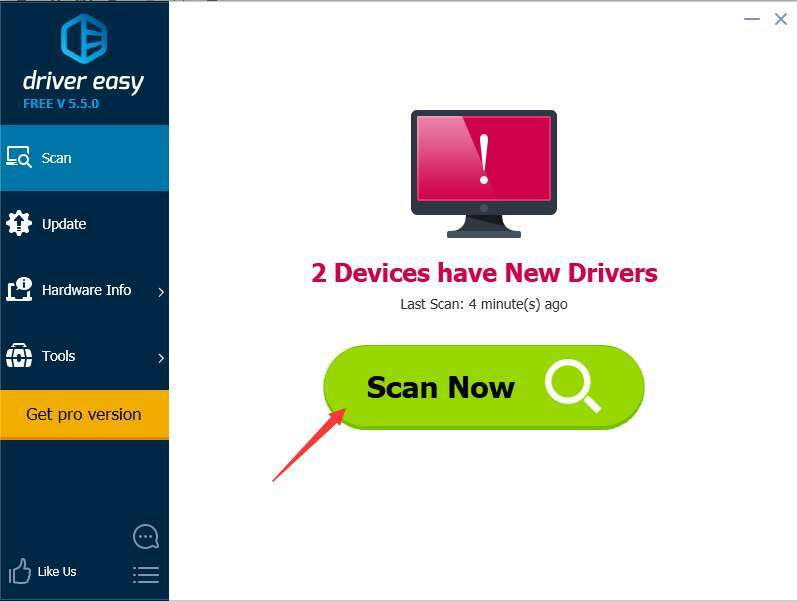 Then Driver Easy will fast scan your computer to detect all problem drivers in your computer including faulty network drivers and give a list of new drivers. Step 2: Click Update button to download the Realtek network drivers. After download completes, if you are not sure how to install the drivers, refer Update Drivers with Free Version. The download speed of Free version is limited. If you want to save more time updating drivers, you can consider using the Professional version. With Professional version, you will get higher download speed. Moreover, you can finish all updates by just clicking Update All button. If you can’t have access to internet, see use Driver Easy Offline Scan Feature to update network drivers without internet connection.